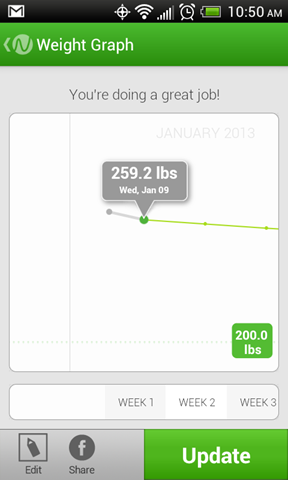 Okay so you might say that I am a bit excited about weight loss all of a sudden. On New Years Eve/Day, I decided that I wasn’t going to make a New Years resolution. I changed my mind when I had my picture taken at IHOP. I decided that I would make one, but it isn’t to lose weight, but more to change my eating habits to live a healthier lifestyle which will help me lose weight in the long run. I don’t want to look at it as a diet, but more of a lifestyle change. 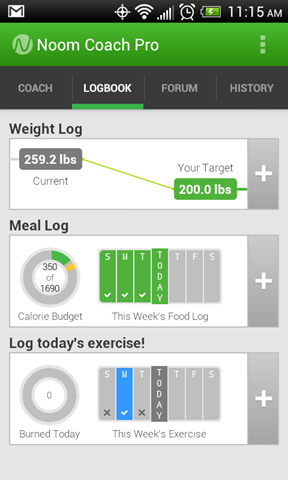 I started looking on the Google Play App Store for weight loss apps and found a few that looked good, but they didn’t really do it for me. I went to the App store and found Noom on the front page. Since it was recommended, I figured what the heck, let’s give it a go and see how it works. It’s a free app, but it has limitations because they want you to pay for the service of using the app. It’s normally $10 a month to go pro, but they have a holiday special right now for only $2.99 a month, $15 a year or $30 forever. I was going to do the $2.99 a month, but you know how that works, you pay $2.99 and the next month it goes back to it’s regular price of $10 a month. I figured I’d probably only do this for 1 year, but you never know. I just want the full version forever without having to worry about paying a monthly or yearly fee. I figured the $30 price will go up if I don’t do it now, so I paid for it and I love it. They don’t pressure you to do things you don’t want to do. They don’t tell you that you can’t have certain foods because telling you what to eat makes people rebel and eat what they want to out of spite. That’s just what I think, the app didn’t tell me that. They do give you some good articles to read with very helpful hints and tips and you get points for everything you do. I am level 4 now. Here are a few of the features that I love about it. When you enter your meals, you have the option of scanning the bar code on the box. That way you don’t have to type it in. You might think that is lazy, but not really because sometimes it can take a few minutes for the scanner to read the bar code, so I’m sitting there like a dufus holding the phone up against a bar code and it keeps trying to focus, but doesn’t do anything. If I place the box on something and steady the phone on a flat surface so I’m not shaking it then it might work better. But I digress. You can also type in a word like Banana and it asks you if you are eating the size of a golf ball, a tennis ball, a baseball or a fist. They don’t ask you how much it weighs, just how much food it is. We have both really changed our eating habits. We started buying Weight Watchers Smart Ones frozen dinners at Food Maxx for only $1.88 each. That is a big help because they are nearly twice that at Albertson’s. 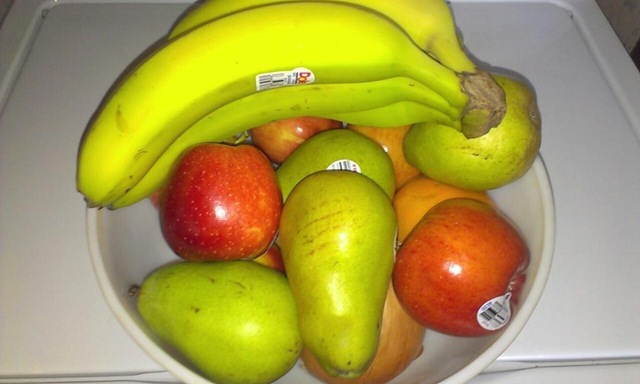 We also started buying more fruits and veggies. 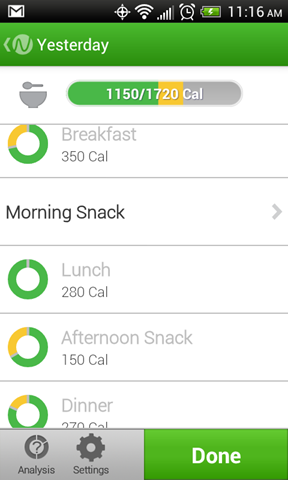 I have actually been more motivated to eat fruits and vegetables from Noom. I took this picture today. My problem is that I have a sweet tooth. I will literally go out and buy candy because I want something sweet all the time. These don’t compare to candy, but they are sweet and they really help and they are green foods in the Noom app, so they are better. 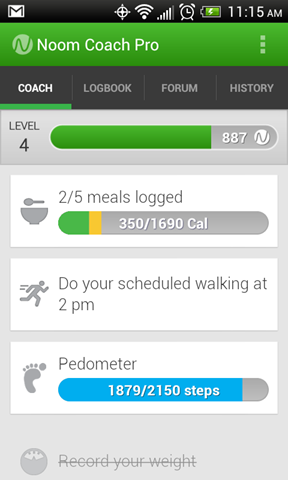 One of the features of Noom that I really love is the Pedometer. If I keep my phone on me at all times, either in my hand or my pocket, it counts my steps whether I’m in the app or not. My phone can be on standby in my pocket and it still counts my steps. 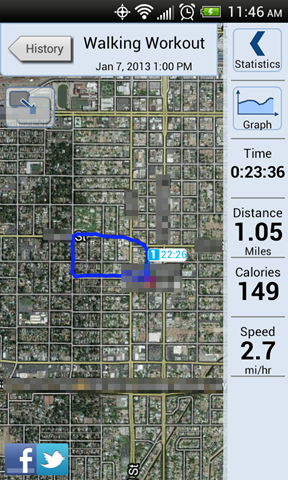 And it has an awesome mapping feature for when I exercise outdoors. If I go for a walk or a bike ride, it uses the GPS to show me where I am going and it even marks my trail on a map so I know where I went. That’s really cool. And it tells me how fast I’m walking or cycling, how many miles and miles per hour and how many calories I’ve burned. My bicycle computer does that, but what it doesn’t do is show me on the map. I think when I start cycling again, I’m only going to bring my phone and not the bicycle computer. Here are some screenshots so you can see what I’m talking about. 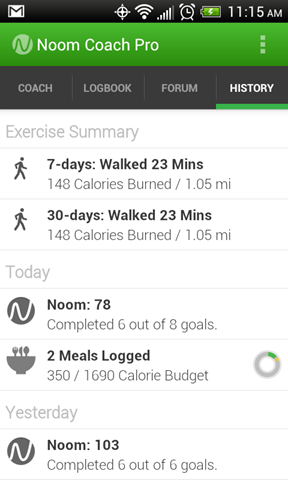 If you are looking to lose weight, I strongly recommend Noom. It’s only available for the Android, sorry iPhone users. Noom is not paying me to write this, I am just very excited about finally having a tool to help me lose weight that actually works without me having to go out of my way to use it. You don’t have to pay for it, you can still use it for free, but you won’t get all the articles. It’s a great app, you should try it.